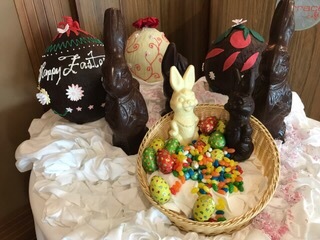 It is Easter here in Thailand today and this is what greeted us as we went to breakfast this morning! 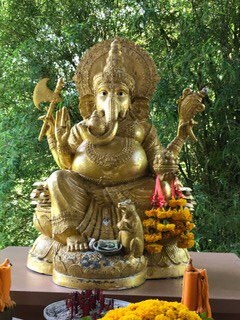 We were in Phuket last cruise and this is where Norm lost his glasses at a temple. Never to be found. We also visited an elephant camp and Norm got up close and personal. This time we decided to do a trip to town (and it is about a 20 minute ride by taxi). It is the last day of the Thai New Year (Songkran) so we didn’t know how crowded things might be or whether shops, etc, would be open. I was looking for a spa day to have nails and pedicure and a massage if we had time. Fortunately traffic was pretty light. So, we hired a cab driver who said he would take us everywhere for $20 US. First we went to the Gems Gallery, fortunately beating most of the crowds. I bought a necklace and bracelet here last time and the bracelet turned out to be too big so I wanted it resized. They gladly did that, and they assign a person to walk (follow) you around. We really didn’t want anything else, I looked a bit just to be polite and then we went to have a cup of coffee and back to our cab driver, Wikit. He told us about a lovely spa and after I asked whether they did nails (my pressing need) he said yes and drove us there. It was beautiful.. but they didn’t do nails. So we went back to the place at Central Festival that the rep on the ship told us about. But not before I took this picture of Gansesha at the spa. The island of Phuket has long been misunderstood. First, the “h” is silent (and Ray, our cruise director, warned us so we wouldn’t get embarrassed by saying it the way it is spelled!!). Of course we knew better already. And, Phuket doesn’t feel like an island, it is the biggest in Thailand so you rarely get the sense that you are surrounded by water. This is a popular tourist destination – it is named the “pearl of the Andaman” by marketing execs and it does live up to its name. I had a lovely gel nail manicure and a pedicure and the cost is almost embarrassing to print. Let’s just say it was 1/8 of what I would have paid on the ship. Then we had lunch – one order of prawn pad thai and one pork rad na with iced tea for $8.36 US. 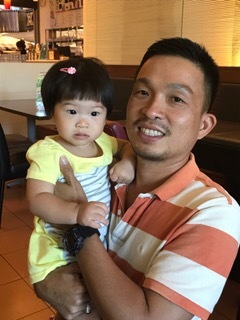 This dad and his adorable daughter stopped by and I just had to have a picure – he told his daughter, in English “tourists” and he wanted to know where we were from. There were no non Asian people in the restaurant so I guess we stood out. 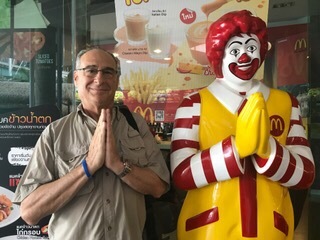 I did a little shopping in a wonderful Thai shop and on our way back out to the cab (he returned to pick us up), we spotted what many tour guides refer to as “the American Embassy”, McDonalds. 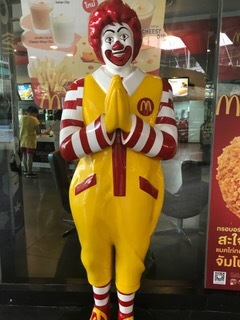 But Ronald looked different here. 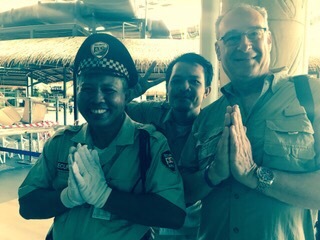 We met some friendly security guards, and they wanted their picture taken too! One of our friends on the ship, the other Norman, got this gift for Norm – because he thought it looked like Norm’s bow ties. 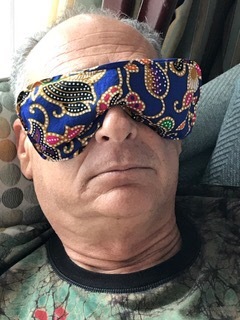 It is a lavender eye mask, as you can see! Norm snored when he put it on, so I guess lavender really does help you sleep. Tomorrow we have a sea day (and an Around the World dinner) and then we head to Myanmar for three days. We will be off the ship for one night as we fly to Mandalay. This entry was posted in April, Asia, Food, World Cruise 2. Bookmark the permalink.